The sun is finally back and shining brighter than ever in sunny Los Angeles, CA. This means that I'm in the mood to enjoy life, relax, and take the time to treat my mind, body, and soul to a day of unwinding and leisure. My first stop was to the new and innovative child-friendly spa, Spa Lé La, located in Studio City. I was super excited for a day of relaxation to usher in Spring with a fresh perspective, revitalized body, and a calm mind. The very first thing that I noticed about the spa was it's warm atmosphere and super friendly staff. I was greeted by Trina Renea, the spa creator, and she couldn't have been more lovely. She talked me through the entire process to make I felt at-home and at ease. My spa day entailed a 30-minute experience in the infrared sauna followed by a healing enzyme facial. The spa smelled of inviting citrus and I sipped on sparkling water while waiting to go in for my treatments with the sweet sound of children's laughter as the backdrop. Usually when you're at a spa there's zero trace of children or babies, but that's what sets Spa Le La a part from other spas as they encourage both men and women to bring their children to the spa with them to receive free childcare while they get pampered and relaxed. Even though I don't have children, I can still appreciate the beauty and genius of this innovative concept. I can go to the spa with my sister and her children and enjoy a Sister Spa Day while my nieces are being cared for. Plus, it's that time where all of my friends are starting to have children of their own and what better way to catch up with a new mom then by sharing massages, facials, mani-pedis, and Mimosas? Did I mention that you also get treated to a complimentary beverage as the spa as well? It really has something for everyone. My skin is still glowing from my facial and my body sweated out toxins and impurities while I was in the infrared sauna for a rejuvenated body, mind, and spirit. 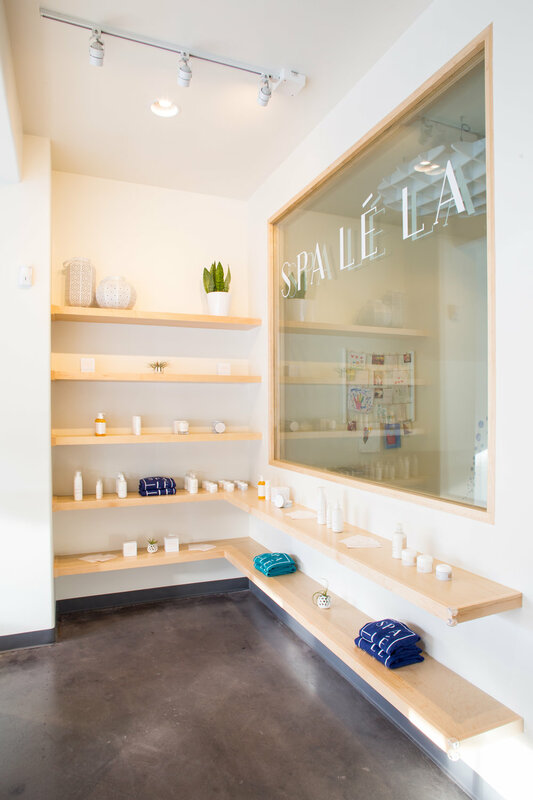 See below for the official scoop on Spa Le La, and connect with them on Facebook, Instagram, and Pinterest. Book your spa day for you and your little one by calling 747-227-4338. Studio City, California - Moms have found their Shangri-La in Spa Lé La, the new Studio City place for pampering that accommodates busy moms by offering quality onsite childcare during treatments. The concept of catering to mommy-me-time is simple, because hardworking moms often don’t have a free hand nevermind free time for a temporary and relaxing escape. Spa creator Trina Renea found that after she became a mom, merging a welcoming sanctuary for moms and safe playful space for kids was a perfect and necessary match. Spa Lé La (www.SpaLeLa.com) is so in tune with the pressures of parenting, it even offers the pleasure of naptime for sleep-deprived mom (or dad) on a sumptuous bed. The entire vision of the spa focuses on mom’s need to make sure everyone else is cared for before she can slip away to find her inner calm. Spa Lé La maximizes precious time for temporary transportation to tranquility by providing attentive care straight away. Staff serves mom her favorite tea ushering her to the sanctuary and joyfully welcomes children to settle them into the all-natural and clean environment of the play area. Designers thoroughly researched the kids zone to guarantee the best possible experience for children ages six months to nine years under the careful watch of CPR certified childcare professionals. While it is safe and sterile, the play area is packed with toys, books, activities, color and whimsy that speaks joy to its precious little clients. Single children receive complimentary care, and it’s $6 for a second child. The innovative spa specializes in $70 combinations of two treatments, whether it be a bath and a nap or infrared sauna and massage throne. Every treatment begins with a soothing hot towel, and founder Trina Renea brings with her expertise in the art of beautiful skin perfected at the popular Facial Bungalow in Los Angeles. Treatments can include getting hair styled for a well-deserved night out and competitive pricing is based on the philosophy that luxury doesn’t have to be outrageously expensive. Following the opening of its maiden spa in Studio City, Spa Lé La will grow to four additional locations in the Los Angeles area. Once moms (dads welcome too) become aware of the gift of an inclusive spa designed specifically for their rejuvenation in Los Angeles, the plan is to launch franchises across America. Moms everywhere will win back their sense of self and be rewarded with rejuvenation and a fresh state of mind to face the real challenges and grind of modern motherhood.